All the world s a stage... One of the most quoted lines of Shakespeare was first heard in this play. 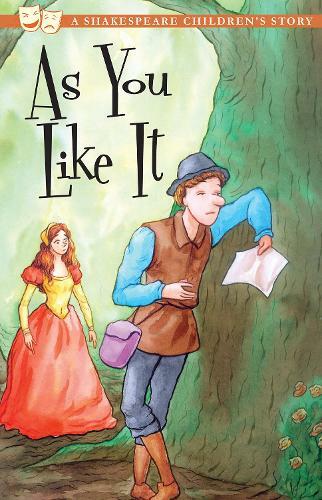 As You Like It is set in the enchanted Forest of Arden, where Rosalind, the daughter of an exiled duke, and Orlando, the son of one of her father s courtiers, become entangled in a game of love and mistaken identity. This short narrative version of the play has been suitably adapted to help introduce the play to young readers. It can be read by children or read to them by parents who wish to introduce them to the play. It can also be used by teachers as a classroom resource. The easy-to-read narration and comic-style illustrations are sure to captivate children s interest and develop their reading skills. Also available as part of a 20 book set, including Romeo and Juliet, Hamlet, The Tragedy of Macbeth, A Midsummer Night's Dream, A Winter's Tale, The Taming of the Shrew, The Tempest, Twelfth Night, Timon of Athens, The Two Gentlemen of Verona, The Merchant of Venice, Othello, Much Ado About Nothing, King Lear, Julius Caesar, Cymbeline, The Comedy of Errors, As You Like It, Anthony and Cleopatra and All's Well That Ends Well.